For a car obsessive such as myself, encountering a car so boring you’re not even sure you’ve ever heard the name spoken out loud is a disturbing experience, one that makes you question the very fabric of reality. I mean, I’m pretty sure I’ve seen a Mitsubishi Tredia before, but have I, really? Maybe it was an Isuzu I-Mark, or an old Stanza, or almost anything else? And the name? Tredia? What the hell is that? Is this real life? 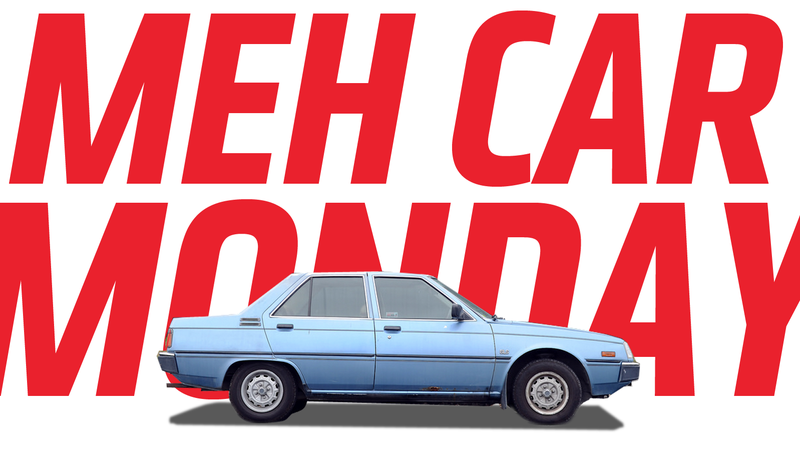 Even for a basic 1980s Japanese economy sedan, the Mitsubishi Tredia is a remarkable cipher. It was built between 1982 and 1990, and was one of Mitsubishi’s first cars brought to the United States independently of Chrysler, who had been importing Mitsubishi Colts, for example, as “captive imports” and selling them as Dodges. I certainly remember Starions of this same era, and maybe even the Cordia—but the Tredia? I try to picture it and my brain just shows me color bars or another ad for reverse mortgages. But it does seem the Tredia did exist. On our Earth, even. The Tredia was a very conventional, boxy, ‘80s-era car, with the front wheels driven by a choice of engines all transverse inline-fours, of course, ranging from a 1.4-liter 68 horsepower and up to a 1.8-liter turbo engine that made a respectable 135 hp. Here in the U.S. we just got two engines, a 2-liter base one making a very meh 88 hp, and a turbo version making 116 hp. As you can see, the engines were just..fine. Basically. Nothing special at all, really, though the turbo 1.6-liter was the first of its kind to be sold in Japan, so you’d think that’d be something? But it’s not, really, because the car is just too damn boring. It’s not like there weren’t some cool details about the car; there were some interesting options, like AWD and a rad-tastic digital dashboard and Mitsubishi’s funny twin-stick overdrive system (previously seen on the Colt) that gave you, effectively, eight forward gears and, I think, two reverse gears. So that’s something! Still, it’s not something enough to save the Tarion—wait, no—Tredulon? No. Tredia, right, Tredia from being swallowed up by the Taupe Hole that’s created when a meh car’s mehness overcomes its structural integrity and it collapses in upon itself. This incredible lack of distinction or character you would think would make an advertiser’s job harder, but that’s not always the case. Sometimes, when a car is so staggeringly dull, it becomes a blank slate, allowing the advertisers free reign to try literally anything, because the car itself just doesn’t even matter. They just have to get the name in there, somewhere. This ad agency could have done this same ad with Mr.Civic or Mr.Corolla or Mr.B210 and it would not have made one lick of difference, because the Tredia is a perfect, generic placeholder car. As I always feel compelled to re-iterate on Meh Car Mondays, the Tredia wasn’t bad, it was just deeply, powerfully unremarkable. I’m really amazed at how effectively this car has evaporated from the collective memories of a nation, and perhaps a planet. I wouldn’t be surprised to find that the Tredia in Mitsubishi’s heritage collection museum had a tablecloth put over it in 2004 and used as a buffet for a party and they’ve never gotten around to uncovering it since.